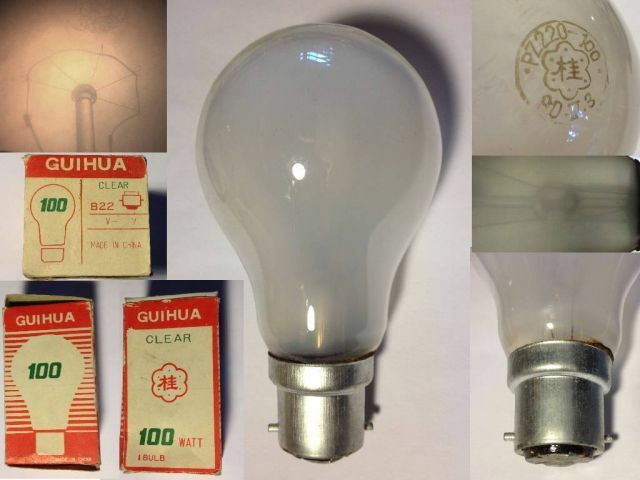 Lighting-Gallery-net - Incandescent Lamps/Gui-Hwa ("Ghost-Flower", I'm told) branded Chinese Fumed Silica Frosted G.L.S. Gui-Hwa ("Ghost-Flower", I'm told) branded Chinese Fumed Silica Frosted G.L.S. I'm told this brand, represented by the two words, "Gui-Hwa" and the two characters in the centre of the etch, and said, "Gwee-Hwa", means, or translates to "Ghost-Flower". Presumably this explains the floral shaped polygon on the etch. This Chinese lamp is unusual in that the brand does not seem to be a place name...as many others seem to be. This is certainly not ashamed to display the three words, "Made in China". Manufacturer: Brand, Gui-Hwa, Manufacturer, ? Company, ? This lamp is from box-117...this is the (retrospective) box I have decided to work through. Box says 'clear", you got an E-coated lamp eh? Some of the Chinese dollar store bulbs sold here are labelled "soft white" on the packages, but the bulbs are actually inside frosted. In South East Asia an English word like, "Clear" on such a box, has about as much meaning to the people there as some random Kanji character on a shakeboarder's T-Shirt in downtown San-Deigo! So I reckon it is the original box or one from the same plant...the brand matches the lamp at any rate!